Crozat(?). Victor Koch, London; (sale, Christie, Manson, & Woods, London, 18 April 1967, no. 48); Alice M. Kaplan, New York; gift to NGA, 2001. Flemish Drawings and Prints of the 17th Century, The Metropolitan Museum of Art, New York, 1970, no. 31. The Alice M. Kaplan Collection, Columbia University, New York, 1981, catalog by Linda Bantel, no. 36. Rubens: The Power of Transformation, Kunsthistorisches Museum Wien, Vienna; Städelsches Kunstinstitut und Städtische Galerie, Frankfurt, 2017. Held, Julius S. Rubens, Selected Drawings. 2 vols. New York, 1959: 1: no. 167, plate 174. Müller Hofstede, Justus. "Opmerkingen bij enige tekeningen van Rubens in het Museum Boymans-van Beuningen" Bulletin Museum Boymans-van Beuningen XIII (1962): 103-105, fig. 16. Jaffé, Michael. 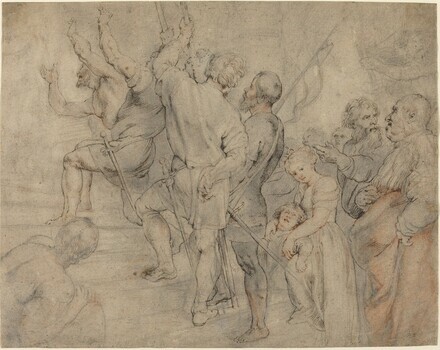 "Rubens as a Collector of Drawings, Part Three." Master Drawings IV (1966): 128-129. Christie, Manson & Woods. Christie's Review of the Year, October 1966 - July 1967. London, 1967: 36. Vlieghe, Hans. Saints. 2 vols. Series: Corpus Rubenianum Ludwig Burchard Part VIII, London and New York, 1972: I: 113. Jaffé, Michael. Rubens and Italy. Oxford, 1977: 34-35, fig. 73. Bober, Jonathan. "Sull'attribuzione a Caravaggio dei disegni del Castello Sforzesco," in Simone Peterzano, ca. 1535-1599, e i disegni del Castello Sforzesco. Franceesca Rossi, ed. Milan, 2012: 67 (fig. 4), 68.